This section displays the alarms, events, and files associated to the investigation. You can click an alarm or an event to go to the alarm or event. The asset name includes a chevron icon that can be grey ( ) if the asset is not in the system, or blue ( ) if the asset has been added to the system. Add to current filter — Use this option to add the asset name as a search filter, see Searching Events for more information. Find in events — Use this option to execute a search of the asset name in the Events page, see Searching Events for more information. 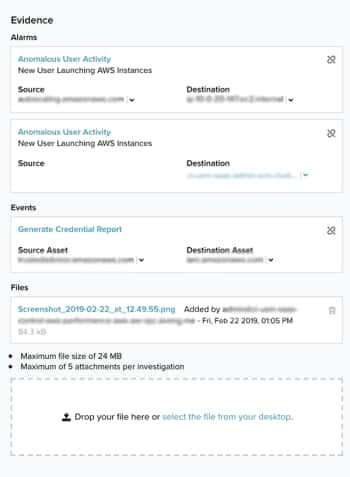 Look up in OTX — This option searches the IP address of the source asset in the Open Threat Exchange page, see Using OTX in USM Anywhere for more information. Add asset to system — Use this option to create the asset in the system, see Adding Assets for more information. Add to current filter — Use this option to add the asset name as a search filter. See Searching Events. Find in events — Use this option to execute a search of the asset name in the Events page. See Searching Events for more information. Look up in OTXThe world’s first truly open threat intelligence community. Enables collaborative defense with open access, collaborative research, and seamless integration with USM Anywhere and USM Appliance, and plugin capabilities for other security products. — This option searches the IP address of the asset in the Open Threat Exchange page. See Using OTX in USM Anywhere for more information. Full Details — See Viewing Assets Details for more information. Configure Asset — See Editing the Assets for more information. Delete Asset — See Deleting the Assets for more information. Configuration IssuesAn identified configuration of software that is deployed, or features of software that is in use, which is known to be insecure. — This option goes to the Asset Details page. The Configuration Issues tab is selected in the page. See Viewing Assets Details for more information. Vulnerabilities — This option goes to the Asset Details page. The Vulnerabilities tab is selected in the page. See Viewing Assets Details for more information. Alarms — This option goes to the Asset Details page. The Alarms tab is selected in the page. See Viewing Assets Details for more information. EventsAny traffic or data exchange detected by AlienVault products through a Sensor, or through external devices such as a firewall. — This option goes to the Asset Details page. The Events tab is selected in the page. See Viewing Assets Details for more information. Go to Activity > Alarms. Search for the alarms you want to add to the investigation and select them. For assistance, see Searching Alarms. Search the investigation or create a new one. See Creating New Investigation for more information. Go to Activity > Events. Search for the event that you want to add to the investigation and select it. For assistance, see Searching Events. Locate the investigation in the Investigations list and select it. In the Evidence section, locate the alarm or the event that you want to remove from the investigation and click the icon. In the confirmation dialog box, click Remove. Go to Activity > Alarms or Activity > Events depending on if you want to remove an alarm or an event. Locate the alarm or event that you want to remove from the investigation and select it. For assistance, see Searching Events. In the confirmation dialog box, click Unlink. There is a maximum file size of 24 MB. There is a maximum number of five attachments per investigation. In the Evidence section, click Select the file from your desktop. The file displays in the list.